After the recent controversy surrounding one of these teams competing in this weekend’s football championship game, everyone is eager to see what result it might have on the game. No matter who you are rooting for one thing is sure, the atmosphere in Downtown Las Vegas will be second only to the that of Phoenix, where the game will take place. There are several great options if you are looking for a fun place to watch the game Downtown. 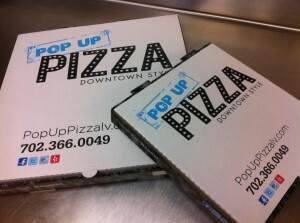 Before, during or after, head down to Pop Up Pizza for a slice of your favorite specialty pizza. For an admission price of $25, this Fremont East bar will include and all-you-can-eat menu. They are also offering a free Rolling Rock draft beer with the purchase of any and every shot ordered. The doors open at 1 p.m. and organizers are expecting to fill up quick. This is the place to be if you are watching the big game with the entire family. 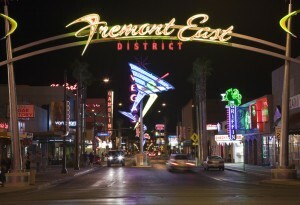 There will be free gifts for the kids and a family friendly party at 2 p.m. For mom and dad, this Fremont East attraction will feature food and drink specials. Anyone looking for a less expensive place to watch the big game in Downtown should check out the iconic El Cortez hotel and casino. Their sports book and all casino bars will show the game for free and will also feature $1 hot dogs and $2 beers. This iconic Downtown casino will feature an unlimited stadium food buffet and an open bar along with betting stations and a blackjack pit for only $100. The main event will take place in the Sierra Ballroom with a less expensive party also taking place in Omaha Lounge. Located on Fremont Street, this live music venue will offer all-you-can-eat and drink for $60 per person. The game will be shown on a large projector and several other TVs, there will be seating available for about 150 people. The party will feature delicious BBQ pulled pork, hot dogs, chili, PBR beer, well drinks and wine. If you are looking for a great free event, the DLVEC will feature a heated tent complete with tables, couches, bars, HDTV, and a pop-up sports book. Anyone interested in attending the free event must RSVP as seating is first come first serve, unless you purchase a VIP package. These packages vary in price and guarantee seating and access to unlimited food and drinks. No matter where you end up watching the game don’t forget to stop by Pop Up Pizza for a slice of the best downtown pizza in Las Vegas. 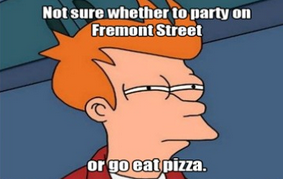 We also offer catering, delivery and online ordering of our famous pizza. Call us at (702) 366-0049 for more information.